Equipment for Leather Craft & Shoemaking, Sewing Machines, Cutting Equipment, Finshers, etc. Finding the right piece of equipment is essential to producing consistent and high quality product. At ShoeSchool we have a complete Cottage Industry Manufacturing Facility for Leather Craft & Shoemaking. It took many years to find and develop this esoteric collection of machines. We have assembled photos of the most important equipment that you will want to include in your shop, specialty sewing machines, cutting, skiving, and finishing equipment. ShoeSchool offers Advance Training Workshops that will teach you how to set up, operate, and maintain each machine. We can also help you to design & engineer your own Studio or Cottage Industry Facility for One-of-a-kind Craftsmanship, or Small Scale Production. Steel Rule Cutting Dies are like Cookie Cutters for Leather. 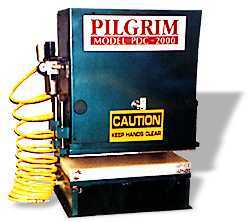 This machine was built by Pilgrim, and is not currently available. It is used to stamp out the pieces, using compressed air to force the top plate down onto the cutting die, with the leather laying on the table. An essential piece of equipment for any type of production. This machine takes the hard work out of cutting. 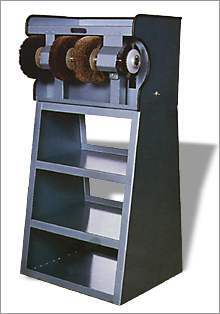 It is next to impossible to find a reliable source for leather and shoe machines, and parts. Pilgrim is a well established company in Boston with experienced and knowledgeable people to help you get the right machine for Leather Craft or Shoemaking. Pilgrim can supply you with parts and service for older machines that you may already own. Steel Rule Cutting Dies are like "cookie cutters" for leather, plastic, paper, cork, rubber and many other materials. Specializing in flatboard steel rule dies for production cutting of component materials for your manufacturing needs. &COPY; Copyright 1981 - Present. ShoeSchool.com. All Rights Reserved.